Cindy Boling is one of the warmest, most compassionate and determined people you'll ever meet. A police officer arrived at her home, the wrong address, on a two-week-old reported copper theft. 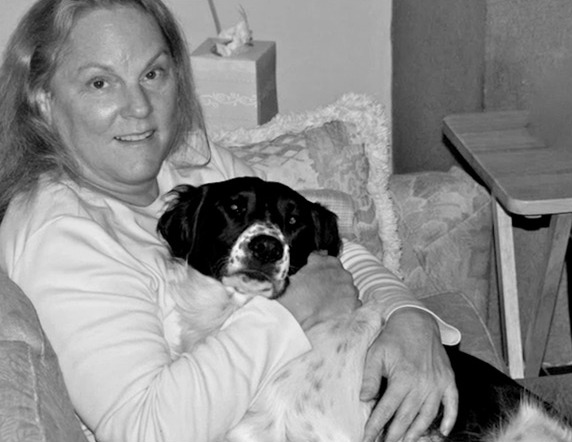 He shot and killed Lily, Cindy's border collie, forever changing Cindy's life. She still mourns Lily's loss, but that loss has given her a mission: to prevent this from happening to other families. She successfully championed the passage of a bill into law requiring canine encounter training for all Texas peace officers. A natural leader, Cheye is a five-term mayor of his town. When tragedy came to his door, he threw himself into changing Maryland law to protect others. Shockingly, officers didn't even know Cheye Calvo was his town's mayor when SWAT raided his home, killing his two black labs. Cheye was innocent of any wrongdoing, but had to fight to clear his name and find justice for Payton and Chase. He won a lawsuit that required police training and record-keeping on the number of SWAT raids and their impact in Maryland. Matthew and Kelley Rodriguez, a young couple with a newborn baby, will not stop until they achieve change for Jane, their rescued pitt. Matthew and Kelley were heartbroken when Jane was shot by police officers responding to an accidental 911 call. Matthew was away on a charity bike ride and Kelley was upstairs nursing her newborn son when police responded to the accidental 911 call made by her young niece. Kelley had initially called the department, informing them it was an accident. Yet, hours later, officers arrived at their home. Within a matter of seconds, the two officers, who were both unharmed, shot and killed Jane. Roger and Sandi won a huge victory in court for their chocolate lab Brandi, but had to challenge the legal system in the process. Roger opened the door one frosty morning to officers asking if he'd seen his adult son. He told them to wait at the door while he put the dogs away. Ignoring his request, the officers began walking toward his home, attracting the attention of the dogs in the backyard. Officers were caught on video as they shot and nearly killed Brandi. The Jenkins' landmark lawsuit against the police successfully challenged the monetary value our legal system places on our pets. One afternoon, Michael was in his backyard playing Frisbee with Cisco. Moments Later, His Beloved Blue Heeler Died In His Arms. An officer arrived at Michael's apartment, a wrong address, on a domestic dispute call. The officer walked up the driveway, gun drawn and pointed at Michael. When Cisco came around from the backyard, the officer, though unharmed, shot and killed him, claiming he'd been attacked. Michael was devastated, but he and his friends launched a social media campaign that drew the attention of the nation, resulting in more than 200,000 followers on his Justice for Cisco page. Sometimes, a reminiscent Cherrie still opens the screen door and calls for Patches, even though she knows her 12 pound Jack Russell terrier is buried near her home after being shot by a 250 pound policeman. Cherrie and Patches were inseparable companions. Inseparable until the day her son's parole officer, a man who had been to their home more than 15 times and had met Patches on each occasion, fired his weapon at the tiny dog, fatally wounding her. Cherrie, a former corrections officer, believes that what happened to Patches was wrong and wants to ensure others don't have to experience the same trauma her family endured.